News and information regarding PMR missions, events & activities. Visit Mission Summaries for a list of missions by date with links to articles. For our Headline Stories dated from 2002 through 2010, you can browse our Headline Archives. Many climbers headed up the south side of Mt. 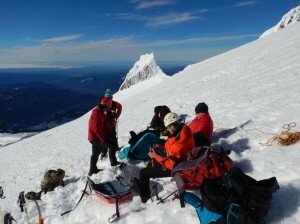 Hood on June 4, 2015 to take advantage of good climbing conditions in the early morning. Unfortunately, one climber, a 66 year-old man, fell from high on the Coleman Headwall and came to rest at the top of Hot Rocks on the west side of the Hogsback. Members of his party, including his 17 year-old grandson, descended to his location quickly and found him not breathing. They started CPR, but to no avail. The Clackamas County Sheriff’s Office contacted PMR at 10:05 a.m. and requested help in evacuating the body. At the same time a group of eight medics from the AMR Reach and Treat Team were conducting a training lower on the mountain. They reached the scene quickly and assessed the situation. One of the AMR medics, who is also PMR rescuer, escorted the rest of the victim’s climbing party down the mountain. Due to delays associated with construction on Highway 26, PMR rescuers did not arrive at Timberline Lodge until around 1:00 p.m. They packed a litter, ropes and other evacuation gear up the mountain and reached the scene around 3:45 p.m. Using PMR’s standard low angle rope system, the PMR rescuers and AMR medics lowered the subject down the steepest terrain and then slid him down to the top of the Palmer lift. From there a snow cat carried them to the Timberline Lodge area, where they transferred the subject to the medical examiner. At this time, PMR does not know whether the subject died from a medical condition and then fell or whether he died from trauma sustained in the fall. Body recoveries are emotionally difficult missions, and we are saddened by this duty. PMR sends its sincere condolences to the climber’s family and friends. As the fumaroles at Hot Rocks and Devils Kitchen melt out earlier this year, PMR urges climbers to be wary of holes and weak cavities in the snow above fumarole areas. The Oregonian, KGW and NBC provided great coverage of this issue. January 31, 2015 was a beautiful clear day on Mt. Hood and many climbers headed for the summit. Portland Mountain Rescue fielded two ready teams that day. The first team left Timberline Lodge at 6:30 a.m. headed for the summit. The second team left the lodge area around 9:00 a.m. for training lower on the mountain. 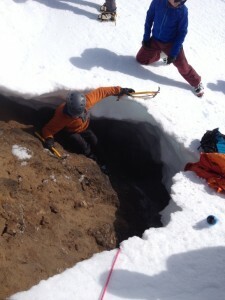 Around 10:30 that morning, the first team was in the upper crater area. One member was descending from the summit, while the other three were on the Hogsback doing outreach with a dozen or more climbers resting there. High on the Coalman Headwall, someone yelled “falling!” and the team witnessed a couple sliding together from the Mazama Chute. One had fallen and slid into their partner; then the rope pulled the second down. Apparently, the rope was not anchored. As they fell roped together, the couple narrowly missed the one rescuer and a couple of other climbers. They slid and tumbled 450 to 500 feet to the bottom of the crater near Hot Rocks. The PMR members on the Hogsback, together with several other climbers, rushed to their aid. 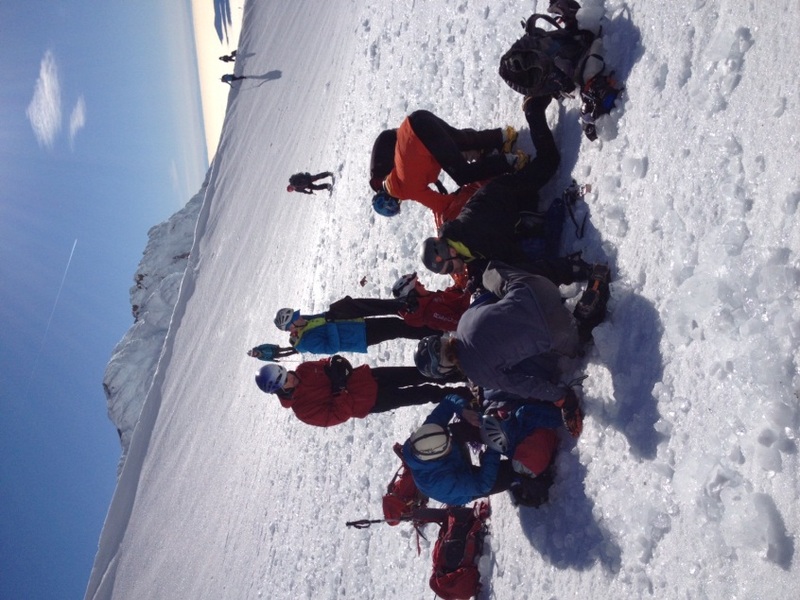 Both climbers were conscious but appeared to be critically injured. PMR assessed their injuries and set about stabilizing the situation, by warming them and attending to their injuries. 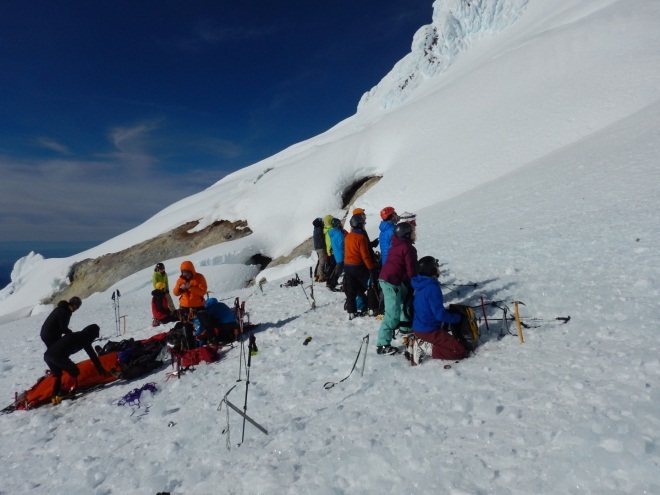 The first PMR team contacted the team lower on the mountain and requested them to alert the Clackamas County Sheriff’s Office and to retrieve litters, medical supplies, ropes and other gear from the PMR cache to package and transport the patients. Fortuitously, two more PMR members who were on a personal climb also arrived at the scene and helped care for the patients. Patient care was immediately complicated by their location, which was the bottom of the funnel-shaped crater where ice and rock fall concentrate. As the sun warmed the cliffs at the top of the headwall, debris whizzed into the area creating a serious hazard. PMR asked volunteer climbers to form a wall above the patients. Using their packs as shields, a dozen or more volunteers deflected ice and rocks away from the patients and rescuers attending them. They kept up this vigil for six hours. Wall of volunteers protecting patients from icefall. 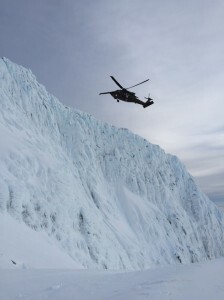 Approximately an hour after the couple fell, a third climber fell from a similar location high on the headwall in full view of all the rescuers. Apparently, he was having trouble with one crampon and lost his footing. 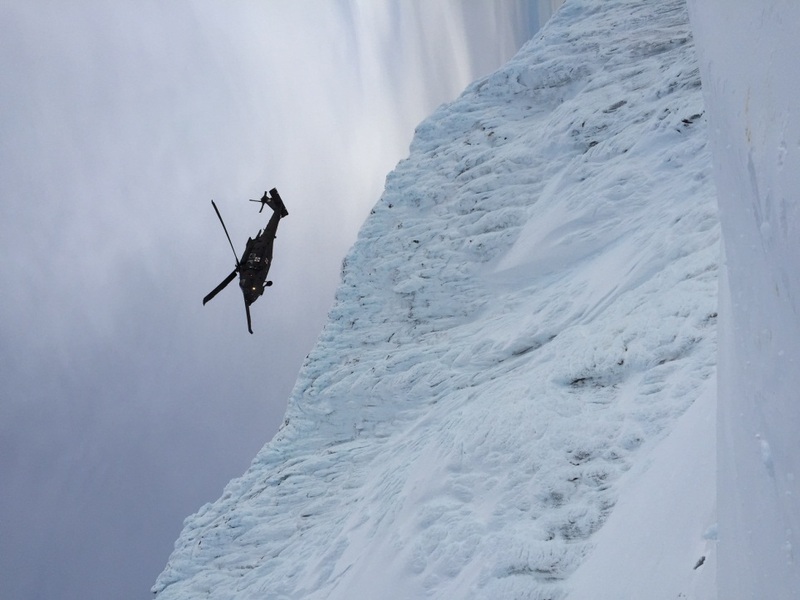 This subject attempted to self-arrest and did initially slow his acceleration down the headwall. However, he lost purchase with the axe and picked up speed. 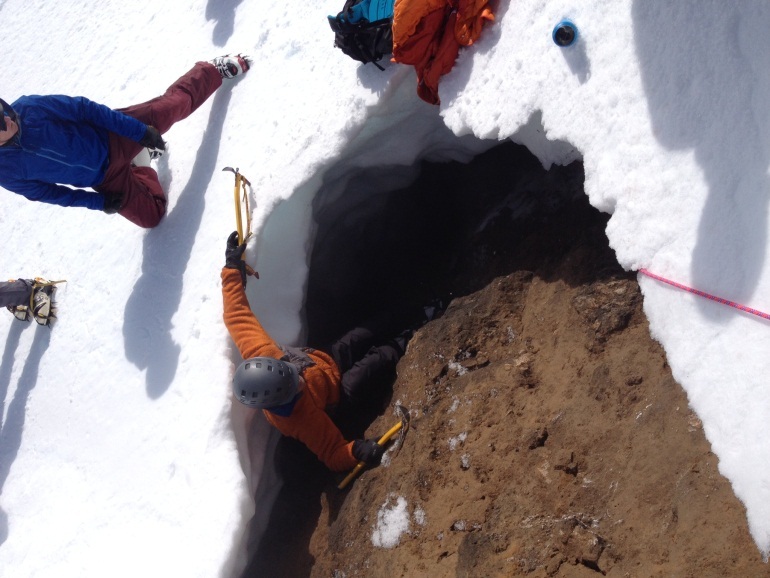 He tumbled and slid down the headwall in the general direction of the first two patients. Near the bottom of the crater, he flew into the air and landed in a fumarole that had melted a large hole in the snow. Members of the PMR team and several volunteer climbers quickly set up a rope system at the mouth of the fumarole and belayed a rescuer into the hole. He found the subject conscious and able to assist with his own extraction. The rescuer fitted a harness to the patient and the team above helped both patient and rescuer back to the surface. This patient was bruised and scraped but ambulatory. PMR provided food, water and warming; after some rest, the patient believed he could walk down with assistance. One PMR rescuer and the patient’s climbing partner assisted him to the Hogsback. The patient was kept on a roped belay from the Hogsback around Crater Rock. He walked from there to the top of the Palmer lift where a Timberline snow cat picked him up and transported him to medics at Timberline Lodge. Meanwhile, the deputy in charge of the mission called for additional resources. 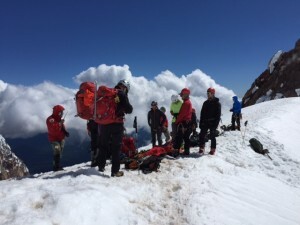 Ultimately, a total of 18 PMR members responded to Timberline, along with five rescuers from Crag Rats and three from Timberline Pro Ski Patrol, all of whom carried gear up the mountain. AMR’s Reach and Treat Team also responded and assumed responsibility for medical care at the scene around 3:00 p.m. Mountain Wave provided communications support, which was sometimes challenging from the location of the patients in the crater. The deputy requested a helicopter evacuation from the Army National Guard. Due to uncertainty about whether the helicopter would be able to hoist the patients from the Hot Rocks area, PMR moved them to a known landing zone on the other side of the Hogsback in Devils Kitchen. The patients were packaged in litters with full-body vacuum splints. The patients in the litters were raised by rope bely and attendants to the top of the Hogsback and then lowered from there down to Devils Kitchen. Around 4:00 p.m. the helicopter arrived, and the patients were loaded aboard for transport to Emanuel Hospital in Portland. Rescuers repacked their gear and headed down the mountain, mostly in the dark. All team were out of the field around 6:30 p.m. 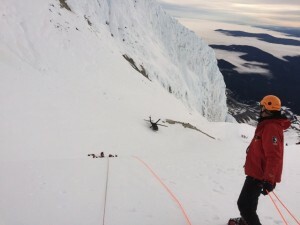 This mission with its two dramatic falls witnessed by many climbers is a harsh reminder that Mt. Hood is a serious climb even on a nice day with relatively good climbing conditions. PMR urges climbers to make sure they have the requisite climbing skills or are guided by a qualified guide who can ensure their safety. When climbing steep terrain roped together, climbers should either be setting adequate protection to hold a fall or using a belay (boot-axe or better); otherwise a falling climber can easily pull off their entire rope team. 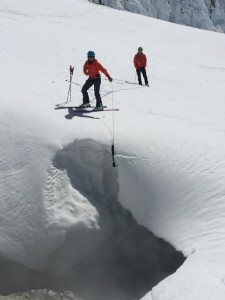 The majority of climbing accidents occur on the descent when climbers are fatigued; good crampon technique is also a bit less instinctive on the descent. When roped on the descent, the strongest climber most competent to hold a fall should go last, and there should be no slack in the rope. On January 10, the subject, a middle-aged man, was hiking above Timberline Lodge on Mt. Hood. He intended to hike to Silcox Hut and planned to return to Timberline Lodge around 6:000 p.m.. The subject was not an experienced hiker and was not well equipped for winter back country travel. He went considerably off course and wandered into the area near Mississippi Head west of Timberline Lodge at about 6700’. Lost, cold and faced with darkness, he called 911. Around 9:00 p.m. , the Clackamas County Sheriff’s Office requested PMR to help locate the subject and help him back to Timberline Lodge. The subject’s cell phone lost battery power, but his coordinates were obtained from his 911 call. There was some question about whether the subject was still traveling or remained near the location of his 911 call. 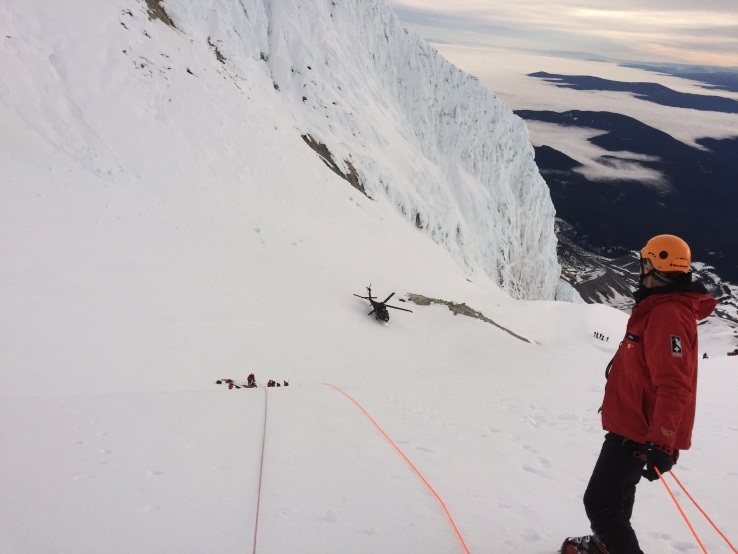 So four search teams from Timberline Pro Ski Patrol, Pacific Northwest Search and Rescue and Portland Mountain Rescue were deployed in an effort to locate him. The PMR team entered the field around 1:00 a.m. on the morning of January 11. At approximately 2:15 a.m., the Ski Patrol team made voice contact with the subject near the location indicated by his 911 call. He had taken shelter from the wind behind a large rock. They provided him warmer clothing and an ice ax, but progress was very slow due to the snow and ice conditions. 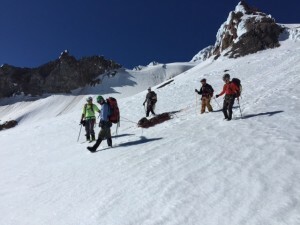 When the PMR team returned to base around 3:30 a.m., the deputy in charge assigned them to deliver snow shoes and crampons to the ski patrol team, which they did. The Ski Patrol and PMR teams escorted the subject to Palmer chair lift where a snow cat picked them up and carried them to Timberline Lodge. All teams and the subject were safely out of the field around 7:00 a.m.
PMR often is called to assist hikers or climbers on Mt. Hood who were not properly equipped for their trek. Conditions above tree line on Mt. Hood can change from temperate to cold, wet and windy to raging blizzard in just an hour or two. We encourage all hikers and climbers to prepare for the worst possible conditions and to be equipped to stay out overnight. Two climbers, a father and son, had climbed the south side of Mt. Hood and were descending near the base of Crater Rock. The surface was icy. Father’s crampons were loose or broken and he lost purchase on the ice. He slipped and slid fast toward Triangle Moraine for about 200 feet. Another climber who witnessed the fall was the first to reach father. He was banged up from hits on the rough ice surface and appeared to have a head injury. The climber and son determined that a rescue was necessary and called 911. They moved father to a location just below Triangle Moraine at about 9500’ elevation. Around 9:20 a.m., the Clackamas County Sheriff’s office contacted PMR and requested an evacuation. A team of two AMR Reach and Treat medics were first to the scene and worked to stabilize the patient. The first team of four PMR rescuers was in the field by around noon and a snow cat had them to the top of the Palmer around 12:35 p.m.; they reached the patient around 1:05 p.m. They assisted in stabilizing the patient and readied the patient for transport. A second PMR team of four rescuers carrying more gear followed and assisted with transporting the patient. Weather conditions were favorable, and the evacuation was straight forward. PMR teams turned the patient over to Timberline Ski Patrol at the top of the Palmer lift who skied the litter down to the Timberline parking lot. 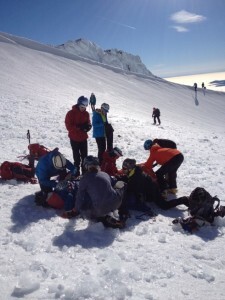 All rescuers were out of the field at 3:30 p.m.
PMR reminds climbers that Mt. Hood requires technical gear and climbing skill for a safe climb under most conditions. Crampons and boots designed for technical mountaineering are necessary. And make sure your crampons properly fit your boots and are securely attached. PMR’s first team begins to assemble the litter, while assessing the patient.